West Bengal is believed to be one of the oldest-living places in the world and has been mentioned in the epic Mahabharata and Ramayana several times. Being such an age-old thriving place, the presence of historic buildings and ancient monuments is not uncommon. There are several cities and towns in West Bengal which represent the rich culture and history of the state. Bankura is certainly one amongst these ancient places which are popular today for their rich cultural heritage. So, how about exploring this beautiful place this season? If you are looking for a perfect weekend getaway, then you must plan a trip from Kolkata to Bankura now. As Bankura experiences hot summers, it cannot be visited during the months of the summer season. The climatic conditions are favourable during the winter season; hence, the best time to visit Bankura is from October until the end of March. By Air: The nearest airport is at Kolkata,at a distance of about 210 km from Bankura. By Rail: You can get a direct train to Bankura Junction from Kolkata and the nearby cities. By Road: Situated at a distance of around 210 km, Bankura is easily approachable by road. It will take you an approximate time of 4 hr to reach your destination. While on your way to Bankura, you can take a break at Bardhaman and Durgapur too and savour their beauty. Located at a distance of around 100 km from Kolkata and 110 km from Bankura, Bardhaman is an ancient town which has been in existence since the time of the Stone Age. It is popular amongst tourists for its heritage buildings and age-old monuments and temples; hence, it is also known as the Royal Heritage City of West Bengal. This beautiful town has derived its name from Lord Mahavira, who stayed at this place for a period of time. The major places to visit in Bardhaman include 108 Shiva Temple, Damodar River Beach, Hawa Mahal and Curzon Gate. Durgapur is located at a distance of around 45 km from Bankura in the Paschim Bardhaman district and is one of the urban cities in West Bengal. Prospering on the banks of Damodar river, Durgapur is an ideal en route destination if you are looking to take a break amidst green parks and gardens. The major places to visit in Durgapur includeKumaramangalam Park, Deul Park and Bhabani Pathak's Tilla. Bankura is one of the most significant places in the state of West Bengal and is located on the banks of Damodar river. As per legends, it has been flourishing since the time of the epic Mahabharata when it was known as Suhmobhumi. Due to the presence of several historical monuments and heritage buildings, it has become popular amongst national as well as international tourists. Today, it is visited by thousands of tourists every year. Ranging from terracotta temples to beautiful paintings and lush green hills to thriving plains, there is a lot to explore within the boundaries of Bankura. Following are the important places to visit in and around Bankura. Bishnupur is the major tourist spot in the Bankura district and is immensely popular for its terracotta buildings and ancient monuments. 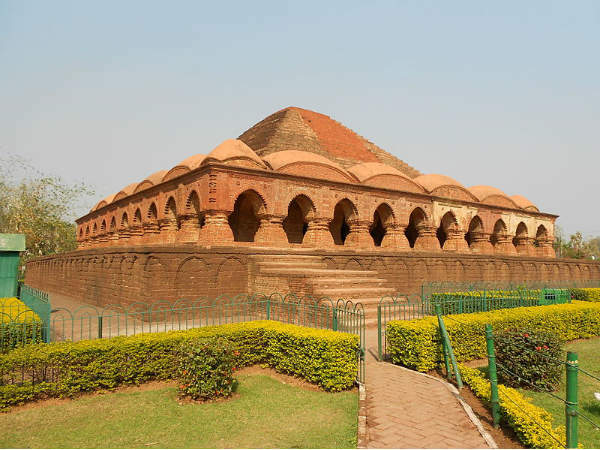 The history of Bishnupur dates back to the era of the Gupta Empire and hence, you can find several historical monuments in the form of temples and forts here. Bishnupur is also well known for its Baluchari sarees which are recognised by their mythological drawings and shades. The major places to visit include Jor Mandir Complex, Hawa Mahal and Fort Gate. Being a part of the Eastern Ghats, Susunia Hill is famous amongst tourists for its rich wildlife, beautiful surroundings and natural springs. Apart from being a natural spot, it is also a popular archaeological site where the oldest rock inscription named Silalipi is located. Susunia is a perfect weekend getaway for mountaineers and trekkers too. Biharinath is a place which should be missed by anyone planning to visit Bankura. Being the tallest hill in the district, it offers its visitors certain surprises in the form of natural atmosphere and beautiful vegetation. It has also been a significant Jain centre in the past. Apart from visiting its forests and water-bodies, you can also visit the ancient Shiva Temple at Biharinath. Jhilmili is one of the most popular places amongst nature lovers. Being a densely forested area, it is visited by thousands of tourists and photographers every year. It is located at a distance of around 70 km from the main town of Bankura and is a must-visit place due to its peaceful aura. Apart from being a perfect picnic spot, it is also good for camping. Located in the Bankura district, Joyrambati is a small village which is believed to be the birthplace of Sri Sharada Devi, who was considered as one of the most significant spiritual gurus in the state. Hence, it has become a holy centre for locals and you can find several temples and spiritual sites at Joyrambati. Apart from being spiritual, you can also explore its green surroundings covered with meadows, grasslands and beautiful trees.